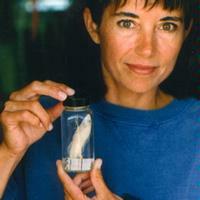 VIMS alumna Carole Baldwin (Ph.D. ’92) likes fish, whether they’re in the water, a museum collection, or a fry pan. Thankfully, her job at the Smithsonian allows her to pursue all three aspects of her lifelong interest in these finny creatures. Baldwin is a curator at the Smithsonian’s National Museum of Natural History, where she has daily access to the world’s largest fish collection. Its 4 million specimens are a treasure trove for her study of the diversity, evolution, and larval development of tropical and deep-sea fishes. She also has access to museum’s 6 million annual visitors. She devotes considerable time to public outreach, including stints as the featured scientist in the Smithsonian’s 3-D IMAX film Galápagos, and as one of three scientists charged with developing content for the museum’s new Ocean Hall. Slated to open in September 2008, the hall will be the museum’s largest permanent exhibit, with 23,000 square feet of displays, a life-sized model of a North Atlantic right whale, two giant squid, and a montage of giant video screens to immerse visitors in the sights and sounds of the living ocean.